A narrow bathroom is one of the most unique design challenges you'll face in your home, but thankfully there are various ways to incorporate the right flooring, bathroom vanity and other features into the space. As you approach your project, make sure to create clear distinctions between each area of your space, or it may just end up looking like a bowling alley. If you have multiple vanities in the space, consider placing them on opposite sides of the room with a space in between. You can then divide the toilet and shower area with an adjoining wall, and you can appoint this addition with storage cubbies or a linen cabinet to help reduce clutter. A glass shower stall may be the ideal choice for the washroom to make it feel much wider. 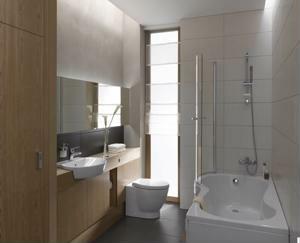 This can include a shower panel to help you enjoy all of the conveniences of a modern bathroom. Additionally, consider placing a towel rack and a piece of artwork on the far wall to incorporate a colorful focal point in the room. Bathrooms come with their own pitfalls depending on their size and scale, but there are plenty of beautiful furnishings that can improve the space's atmosphere. What design tips do you have for those decorating a narrow bathroom?